Teeth By TonightTM is a special and trademarked process that is unique to our office for the immediate replacement of damaged or missing teeth. We can deliver new dental implants, crowns, bridgework or a combination of the three in just a few hours. For your safety and comfort, sedation services are offered in Dr. Vito’s office. In this procedure, we can convert a mutilated dentition and in the same day, provide you with a breathtaking smile that is functional, healthy, and beautiful. We can also apply this same process to individuals who are missing teeth, have no teeth or cannot wear or do not want to wear their removable appliances any more. 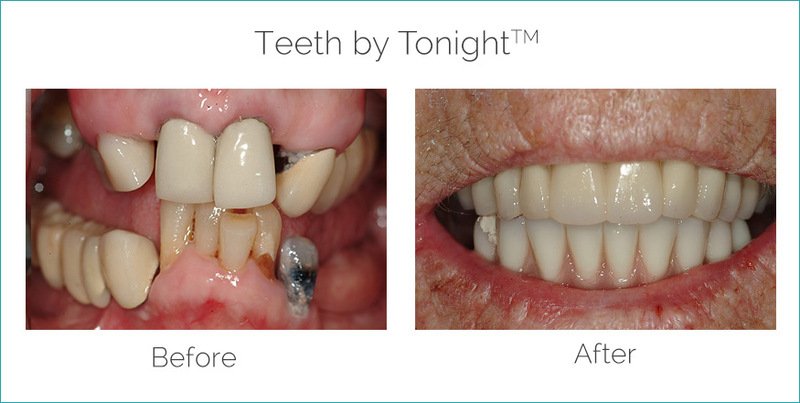 We can replace the missing teeth with dental implants and restore the implants the same day. This process allows us to give you a smile that will last years in only one day! This is a similar procedure as Teeth By TonightTM. A patient with a mutilated or failing dentition is seen for a 3D CT scan where a plan is made for the removal of all their teeth. Dental implants are placed, and a dental implant supported tooth restoration is then attached to the dental implants as a permanent restoration. Normally this is a treatment that in the past used to take 8-10 months to complete. Now in can be performed in as little as 24 hours. If you have failing teeth or have loose fitting dentures call and see if you are a candidate for this life altering procedure. For more information on Teeth In A Day or Teeth By TonightTM in the Philadelphia, PA and Main Line area, contact our Cosmetic Dentistry office today (610) 971-2590.